St. Peter's Square, Rome. White smoke signals that a new Pope has been chosen.Is it possible that the new Pope...is a woman?The world is watching as massive crowds gather in Rome, waiting for news of a new pope, one who promises to be unlike any other in history. It's a turning point that may change the Church forever. Some followers are ecstatic that the movement reinvigorating the Church is about to reach the Vatican, but the leading candidate has made a legion of powerful enemies who aren't afraid to kill for their cause. Faith has never come easy for Brigid Fitzgerald. From her difficult childhood with drug-addled parents to her career as a doctor healing the wounded in Sudan to a series of trials that test her beliefs at every turn, Brigid's convictions and callings have made her the target of all those who fear that the Church has lost its way--dangerous adversaries who abhor challenges to tradition. 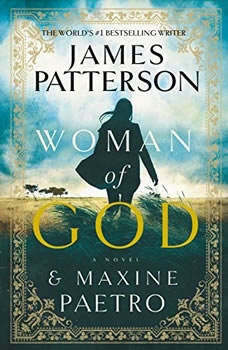 Locked in a deadly, high-stakes battle with forces determined to undermine everything she believes in, Brigid must convert her enemies to her cause before she loses her faith...and her life.Spanning the globe--from the drug dens, high-powered law firms, and churches of Boston to the horrific brutality of a civil war in the Sudanese desert to the beauty, violence, and spiritual enlightenment of the Holy Land--Woman of God is an epic, thrilling tale of perseverance, love, trust and nothing less than what it means to live in a fallen world.